Here's the Rowan cardigan. I finally found some time to put in the zipper last night. I thought I was going to have to sew it in by hand because the yarn was too chunky for my sewing machine, but all that backstitching would have been too much for me to bear. So, I found a way to get the sweater through my machine. It looks a little sloppy up close, but I figure I'll be wearing the sweater mostly at home anyway. I used a contrasting yellow zipper and I like how it turned out. 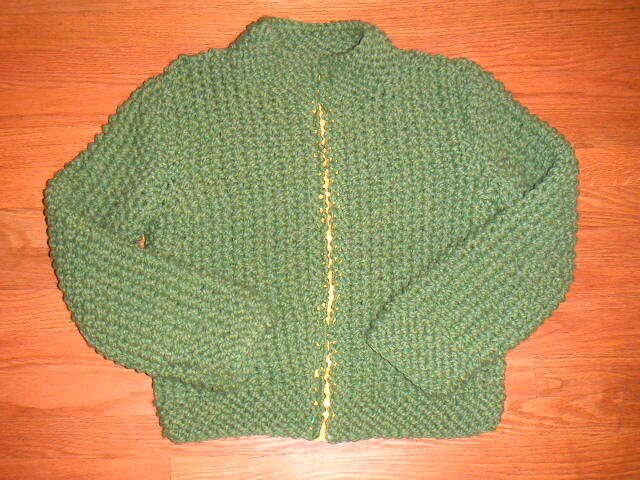 I think the sweater will look better once I give it a wash and the stitches are blocked.